The Japan Style Sheet is compiled to assist writers, editors, translators, graphic or web designers, administrators, office staff, or anyone working with English-language publications related to Japan. The advice in this guide grows out of the accumulated experience of in-house and freelance editors working with Japan-related material over the past several decades. Intended to supplement standard style manuals for English-language publishing, it reflects reliable practice for general publications, journalism, web publishing, books and periodicals, and to some extent scholarly works. The JSS was compiled by volunteers of the Society of Writers, Editors, and Translators (SWET) and first published in 1983. The second edition, published by Stone Bridge Press in 1998, was kept in print for 20 years. The third edition, building on the know-how of past Japan-related wordcraft, is updated for the digital age and expanded to include guidance on more recent editorial issues. This publication is provided as a public service by the Society of Writers, Editors, and Translators, and supported by its members whose dues make possible the print publication, the launching of this website, and the maintenance of these services to users everywhere. 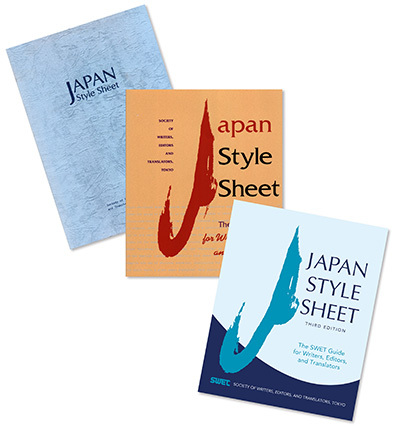 In addition to the digital edition, which may be downloaded at this site, printed copies of the Japan Style Sheet are available for order at the SWET website.